Is éard a bhí i gceist le dlíthe Nürnberg nó Nürnberger Gesetze as Gearmáinis ná na dlíthe ciníocha sa Ghearmáin Naitsíoch a choisc ar na Giúdaigh "Airianaigh" a phósadh agus a bhain saoránacht na Gearmáine díobh. Ritheadh na dlíthe sa bhliain 1935, le linn Ard-Fheis pháirtí na Naitsithe a bheith ar siúl i gcathair Nürnberg. Ba é ba bhunús leis na dlíthe ná cineál réasúnú bréageolaíoch, is é sin, glacadh leis mar phrionsabal go raibh máchail ghéiniteach, bhitheolaíoch ar na Giúdaigh, agus gur chóir na Giúdaigh a dhealú ó na "hAirianaigh" lena chinntiú nach dtolgfadh an "cine Airianach" an mháchail seo ó na Giúdaigh. De réir dhlíthe Nürnberg, bhí na saoránaigh le rangú ó thaobh creidimh agus cine de. Chaithfeadh gach duine imréiteach ginealais a fháil lena chinntiú nach raibh Giúdaigh i measc a shinsear. An duine a bhí i dteideal na saoránachta, ba Ghearmánaigh iad tuismitheoirí a mháthar is a athar, nó ar a laghad, eachtrannaigh "ghaolmhara", Airianacha a bhí iontu. Más triúr nó ceathrar Giúdach a bhí ann, ba Ghiúdach é an duine féin. Más Giúdach amháin nó beirt Ghiúdach a bhí ann, ba mheascach é an duine - Mischling an téarma Gearmáinise. Ní ceadmhach d'aon Ghiúdach géillsineach de chuid an Stáit a phósadh a bhfuil fuil Ghearmánach nó ghaolmhar ann. Níl aon phósadh bailí a shocraítear ina ainneoin sin, na póstaí san áireamh a shocraítear thar lear le teacht timpeall ar an dlí seo. Ní féidir ach le hIonchúisitheoir an Stáit tús a chur leis na nósanna imeachta le pósadh a chur ar neamhní. Ní ceadmhach d'aon Ghiúdach dul i gcomhriachtain sheachphosta le géillsineach de chuid an Stáit a bhfuil fuil Ghearmánach nó ghaolmhar ann. Ní ceadmhach d'aon Ghiúdach bean aimsire a fhostú le haghaidh oibreacha tí agus tinteáin, ach í a bheith níos sine ná 45 bliana d'aois. 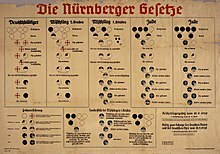 Ní ceadmhach d'aon Ghiúdach bratach an Reich nó an bhratach náisiúnta a chur ar foluain ná dathanna an Reich a thaispeáint. Ón taobh eile de, is ceadmhach dó dathanna na nGiúdach a thaispeáint. Ceart é seo atá faoi chosaint an Stáit. Aon duine a sháróidh an cosc atá leagtha amach in §1, gearrfar pionós daoroibre air. Aon duine a sháróidh an cosc atá leagtha amach in §2, gearrfar téarma príosúnachta nó daoroibre air. Aon duine a sháróidh an cosc atá leagtha amach in §3 nó in §4, gearrfar téarma príosúnachta aon bhliana amháin nó níos lú air agus fíneálfar é, nó gearrfar ceann den dá phionós seo air. Eiseoidh Aire Gnóthaí Inmheánacha an Reich, in éineacht le Fear Ionaid an Führer agus le hAire Dlí agus Cirt an Reich, na rialacháin dhlíthiúla agus riaracháin is gá chun an dlí seo a chur i bhfeidhm nó a chomhlánú. Tiocfaidh an Dlí seo i bhfeidhm ar an gcéad lá i ndiaidh lá a fhógartha, ach amháin §3, a thiocfaidh i bhfeidhm ar an 1 Eanáir 1936. Führer agus Seansailéir an Reich. Aire Gnóthaí Inmheánacha an Reich. Aire Dlí is Cirt an Reich. Cairt mhíniúcháin ón mbliain 1935. Míníonn an chairt na coincheapa Deutschblütiger - Gearmánach de réir folaíochta -, Mischling zweiten Grades - meascach den dara grád, is é sin, ceathrú-Ghiúdach, - Mischling ersten Grades - meascach den chéad ghrád, nó leath-Ghiúdach, - agus Giúdaigh. Mar is léir ón gcairt, bhí sé ceadaithe do mheascaigh den dara grád "Airianaigh" a phósadh, ach chaithfeadh meascach den chéad ghrád ceadúnas ar leith a lorg ó na húdaráis. Is éard atá i gceist le géillsineach de chuid an Stáit ná duine a ndlítear cosaint an Reich dó agus a bhfuil dualgaisí ar leith air dá réir sin. Bronntar stádas an ghéillsinigh ar an duine de réir mar atá leagtha amach sa Dlí um Shaoránacht an Reich agus an Stáit. Is éard atá i gceist le saoránach de chuid an Reich ná géillsineach de chuid an Stáit a bhfuil fuil Ghearmánach nó ghaolmhar ann agus é á chur in iúl lena iompraíocht go bhfuil sé chomh hábalta agus atá sé fonnmhar a dhicheall a dhéanamh ar mhaithe le muintir na Gearmáine agus leis an Reich féin. Bronntar saoránacht an Reich ar an duine trí Theastas Saoránachta an Reich a eisiúint. Níl cearta iomlána polaitiúla, mar atá siad leagtha amach sa dlí, ach ag na saoránaigh. Eiseoidh Aire Gnóthaí Inmheánacha an Reich, in éineacht le Fear Ionaid an Führer agus le hAire Dlí agus Cirt an Reich, na rialacháin dhlíthiúla agus riaracháin is gá chun an Dlí seo a chur i bhfeidhm agus a chomhlánú. Tugadh an leathanach seo cothrom le dáta an 15 Aibreán 2018 ag 04:28.